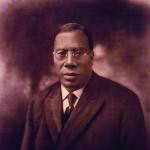 July 26, 1933 Charles Albert Tindley, gospel music composer and Methodist minister, died. Tindley was born July 7, 1851 in Berlin, Maryland. At birth, Tindley’s father was enslaved, but his mother was free, therefore he was considered free. Tindley was primarily self-educated, but he did attend night courses and took correspondence courses as the Boston University School of Theology, eventually earning a doctorate while working as a church janitor.